When Reebok urges its most die-hard fans to get a big tattoo of the brand's logo, it means a big tattoo. Last month, the sportswear company set up a pop-up tattoo shop at the Tough Viking competition in Stockholm, and promised to give a one-year sponsorship, worth some $5,800 in Reebok gear, to whoever walked away with the biggest version of the brand's new triangle logo on his or her body. Well, the results are in, and the prize went to a 24-year-old woman named Camilla Nilsson, who got a massive Reebok logo on the back of her right thigh. Eight other people got smaller versions of the tattoos at the Aug. 30 event, while 94 more who couldn't be accommodated in time put their names down on a waiting list, according to agency The Viral Company, also based in Stockholm. The delta logo, born of Rebook's booming CrossFit business, is generally meant to signify transformation. Nilsson describes hers as a memento of going from out of shape in 2012 to exercising at least five times a week, and ultimately finishing the Tough Viking obstacle race this year—a story arc presented in a new print ad featuring her and her ink. "It's a really cool looking graphic, but mostly it symbolizes the changes I've gone through over the past year," she adds in a statement. "Why not?" she says in the video above. It's hard to fault anyone for reveling in a sense of personal accomplishment, even if the celebration is funded by a corporation and ultimately designed to benefit that corporation. 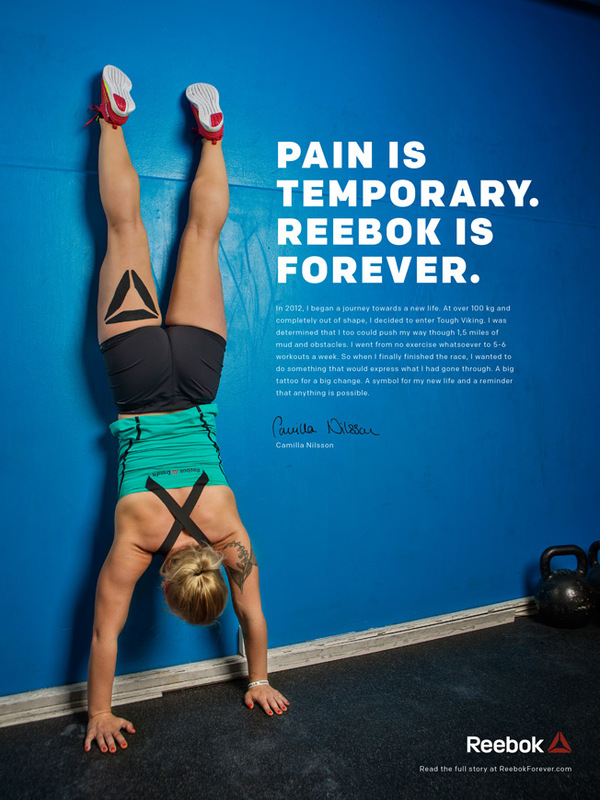 The whole campaign certainly fits Reebok's mission of focusing on hard-core fitness junkies, and is appropriately captured in the tagline, "Pain is temporary. Reebok is forever." Of course, the partnership is perhaps more uncomfortably permanent for the individual than it is for the corporation—some might call it a bold move, others silly. But if Reebok ever proves less than true to its current identity, at least Nilsson doesn't have a brand name printed on her leg.